When I checked over Riant’s sails I noticed that what I thought was a bolt “rope” in the luff of the sail had shrunk away at the tack by about 9 inches. I thought that I would be able to easily get this repaired but whilst I was sorting that out I thought I would get some quotes for new sails. I asked the two well known suppliers of Romilly sails for a price and Jeckells, for comparison. Only Westaway seemed to get the spec right with 3 full length battens and their price was a very reasonable £870 +VAT and carriage. Which is a good bit less than the next most expensive. As it turned out my sail repairer was able to do the job while I waited and only charged £10. My sails are Osen and what I thought was a bolt rope turned out to be monolithic solid rubber about 7mm in diameter line. What the sail maker did was to unpick a section of the luff pouch and then loosen the plastic stoppers at the luff end of the battens. 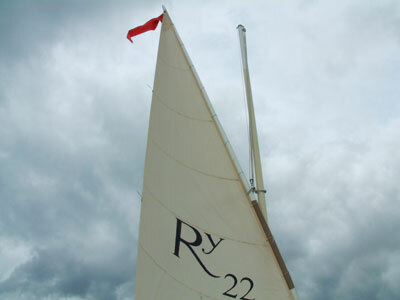 We then stretched the rubber “bolt rope” back to the full length of the sail and he stitched it into place. Sewed up the luff pouch and tightened the batten stops and the jobs a good en!